The times when my friends enjoyed going to parties and cinemas, I was enjoying helping the society. I never got money or stardom on helping people but I was receiving the end of satisfaction, happiness and respect. The year was 2015; Earthquake of magnitude 7.8 had struck my motherland, Nepal. There was chaos and fear everywhere. And, after a month of it we were rising again, slowly but steadily. It was during those days. I used to leave my home at 6 in the morning for my classes. I had classes till 11. 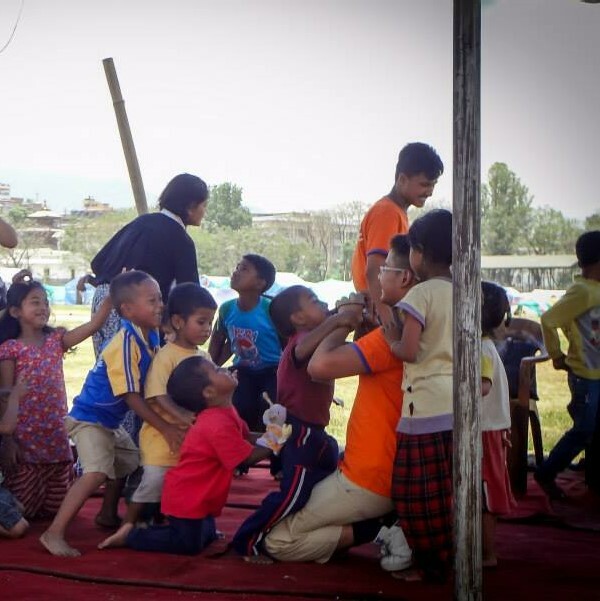 As soon as my classes were over, I used to go to Tundikhel (a public ground in heart of Kathmandu, capital of Nepal) where Corona Nepal; an NGO had run shelter for traumatized children. I had volunteered there and was in a mission to bring back the smile in the faces of children by teaching them drawing, narrating stories and spending time with them. As the clock strike 1, I used to go to Nepal Scouts headquarter to my Scout masters home which was our base camp during those days. I was a part of Nepal Scouts earthquake rescue team. We used to clear up the roads for people to enter their home and helped people take out their belonging from rubble and transport it to a safer place. We were never asked to do such works out of compulsion or for money. We did it because it was our duty during times of need. The applause you receive from people after you help them enter their house after a month or save their favorite things from a destructed house are filled up with such respect and dignity that it motivates and inspires you to do more of such things. That glass of water people offer you after you drain your energy trying to clear up the path for others to walk is filled up with gratitude and respect that it push you to never back down from helping others. These moments make you attached to the society you live in. Even after two years now whenever I feel low, I remember those days that made me the person I am today. Those days of service taught me what it means to be living a life rather than just breathing. In 2016, I along with my two friends formed a group in Facebook and named it Teenage Society of Nepal, also known as TSN. We gathered a group of teens who wanted to do something for the society. We had a virtual meeting. Thus, TSN was born. We always believed in the fact that if we start making teens of today aware about their responsibility towards the society, the will grow up as motivated youths who want to serve the society and these motivated youths one day will grow up to be concerned parents that will build up better generation of humanity to live in this earth, who care about their society and environment. Virtual meetings and creating awareness in Social Medias was not enough. Thus, TSN members formed a committee and I was elected the president of the society. None of our teens in society were earning so we had to hold meeting in public parks during Saturdays, and discussed what project we can carry on from our side to help the society to make it a better place to live in. Our very first project was making our naïve friends know the truth of the society. We went to a school in a remote place, where we hiked for 3 hours to reach. There, our friends realized how hard it is to get education. Everyone was so motivated that after couple of months we were able to make a library in that school by collecting books from friend circle and self-donation. Some weeks later, TSN was informed about a 10 year old girl suffering from blood cancer and had poor economic condition. Despite the fact that everyone in the TSN were high school students and were not earning, we wanted to help that girl. We saved our money from lunch and raised capital to buy pens. We bought pens for 10 rupees and sold them to our high school friends for Rs. 25. They happily bought the pen when the cause was explained to them. A total of 25,000 rupees was collected and was donated to the girl. Even though none of us were earning members of the society, but the team was full of determination. We look forward to build a global network of people with willingness to help. Thus, this is my social life story. I know my works are not too big, but I feel satisfied of what I do. I feel contended on helping people. Today, I feel proud walking through the same roads which we cleared during the earthquake, but no one remembers me because I was wearing a mask back then. These works make me feel more attached to my society. It makes me realize my goal in life to make my society a better place and if we have more people determined to make their society better we will end up having a better world to live in.